IMPORTANT: There is an approximate 7 mile //11 km lead-in with one climb before you reach the circuit. 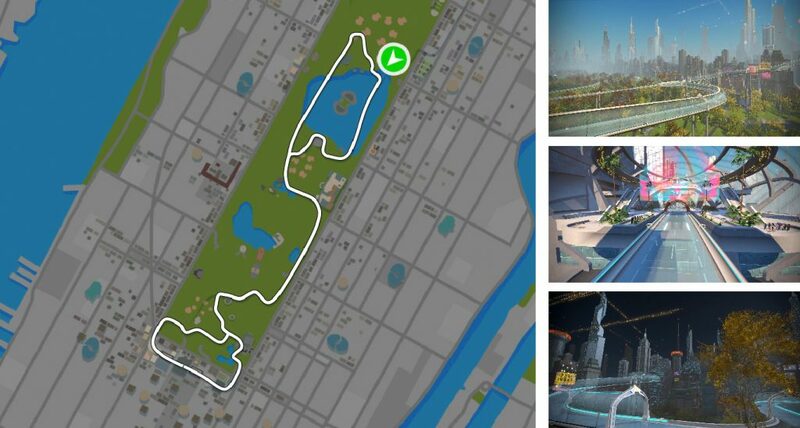 A nod to the elevated park in Manhattan, the High Line, this route sticks to the elevated roads and loops of Zwift’s Central Park. 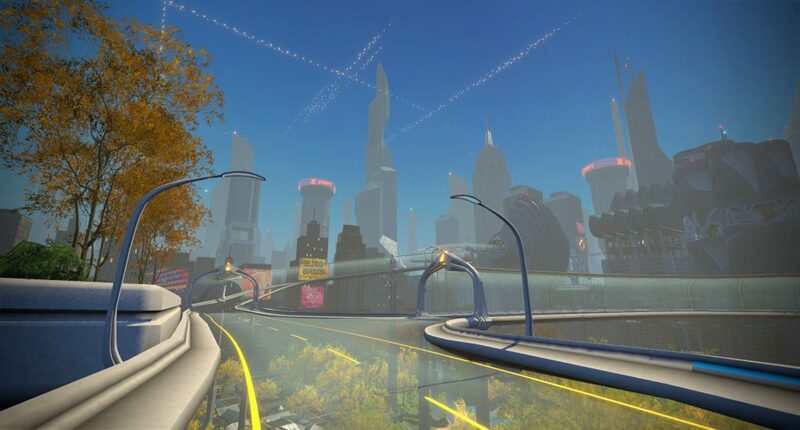 The Highline route also includes the futuristic KOM arch. It’s going to take some work to get here, but it’s worth it. Didn’t someone once sing, “If you can make it here, you can make it anywhere”? Movin’ on up into the sky includes plenty of punchy climbs, with grades as high as 17%. So get ready to downshift and get out of the saddle. One reason Manhattan is a great cycling city for casual riders? It’s flat. Since a lot of Zwifters love climbing that flatness posed a problem. “There are no climbs, besides Harlem Hill, in Central Park. The Highline was the perfect excuse to add some ascents. It also adds a futuristic element,” says 3D artist, Miguel Rivero. A quick bit about the IRL High Line. Founded in 1999, the High Line is on Manhattan’s West Side. The public park was built on a 1.45-mile-long elevated rail structure running from Gansevoort St. to 34th St. Car-free, it’s a great way to gain a fun and new perspective of NYC. And the same goes double for the Skyline Route. At the apex of the Skyline is the KOM Arch. Unlike any other arch in the game, it looks like a hologram worthy of Time’s Square. “It’s a city on top of the City,” says Miguel. Filled with colors, this future is bright. And so many different characters walking around it feels as busy as any proper metropolis. Repetitive shapes add to your sense of movement as you climb. Trees in floating planters. Buildings with lots of shapes. You can even get a good look at our Times Square. Even a few palm trees thanks to an atmosphere imagined by our art team. “When you’re up there you really see everything...it’s a reward for riders,” says Miguel. Underneath the Skyline Road is the public transportation of the future — a tram that utilizes the street above as a track. The subway in the sky goes fast. Really fast. About 100 mph. Getting futuristic straphangers where they have to go. And like all things New York, it maximizes the space available. The concept existed early on. “It was used to justify the high road: to give it more of a purpose,” says Miguel. We relocated the most famous building in New York City on our course. But the skyscraper that King Kong scaled on the big screen still retains its art deco glory. Completed in 1931, the building stands a total of 1,454 feet (443.2 m) tall, including its antenna. See how long it takes you to spot it. The KOM Climb forward segment starts just after the left turn for the KOM Arch road.